Doritis pulcherrima, literally the beautiful Doritis, is a small dainty orchid that is easy to grow and if grown en-masse, can be quite breathtaking. In the wild, they are terrestrial or lithophytic, found along streams and by the coast where the humidity is reasonably high. They can be found growing on leaf litter and rock crevices but are equally adept as an epiphyte, as long as they get enough moisture. The light requirements can vary from dappled sunlight to full sun if slowly acclimatised. Under stronger sunlight, the leaves grow smaller but take a more fleshy appearance and may become marked with purple spots. They also flower more freely when exposed to stronger light. For me, Doritis pulcherrima is an easy orchid that can stand a lot of neglect and abuse.What I am showing here is a Doritis pulcherrima var. champorensis 'White' or alba. Doritis pulcherrima var. champorensis 'White'. 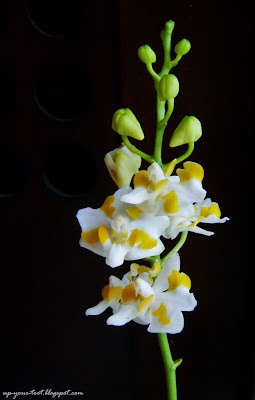 This white peloric form of Doritis pulcherrima has attractive yellow edged petals that somewhat resemble the lip. This peloric form of Doritis pulcherrima is often referred to as var. champorensis. There are variations to the varietal name, some give it as champornensis or chumporensis. 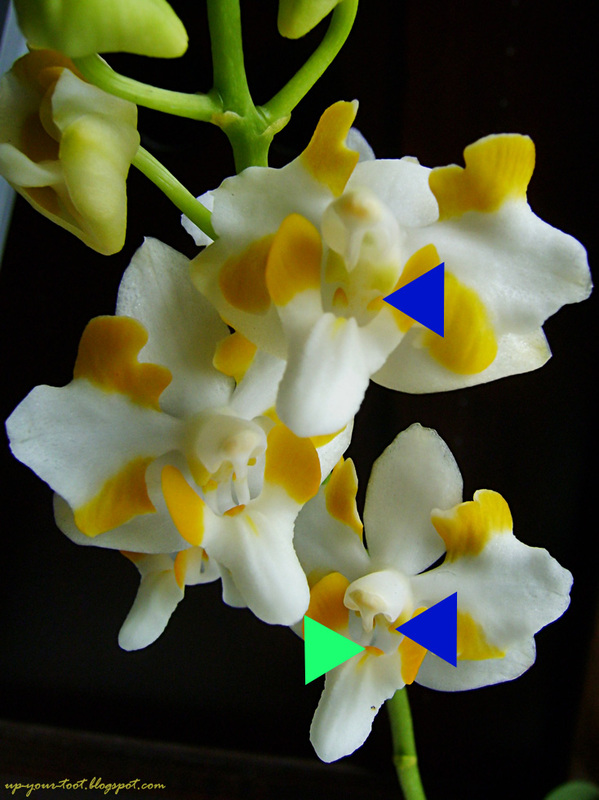 As with the usual Doritis, they come in both the normal pink-lilac and the white version or alba (technically not a true alba, for the yellow coloration of the lip is still present). Doritis pulcherrima var. champorensis is more showy than the usual D. pulcherrima, as the other two petals becomes ‘deformed’ and takes on the colouration as well as the shape of the lip. Close-up on Doritis pulcherrima var. champorensis 'White'. The lateral petals have the yellow markings similar to that of the lip. The shape of these petals are also more spear-shaped and fleshy like the lip. In orchids, the peloric forms can range from mild, where the petals take on some of the colouration but not the shape of the lip, to full peloricism, where you get three lip structures instead of one (no normal petals). In D. pulcherrima var. champorensis, the petals take on the colouration and some of the shape of the lip. Hence the petals appear bigger and showier than a normal D. pulcherrima. The lip of Doritis is interesting, as there are yellow calli on the claw of the lip as well as side lobes that have yellow blotches, looking very much like the pollen mass of a flower. These pseudopollinia (false pollen mass) possibly play a role in the pollination biology of the flower. The green arrow points to the calli on the claw of the lip whilst the blue arrows indicate the yellow coloured tip on the lobes of the lip. These structures are supposed to look like pollen masses (pseudopollinia) that is used to entice pollinators to the flowers. According to Jin et al. (2012), Doritis pulcherrima is a con artist, i.e. 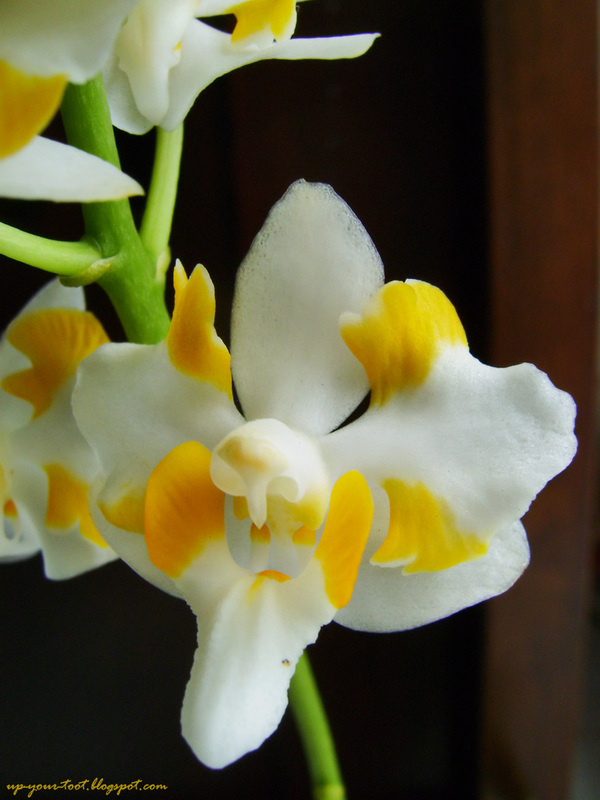 it employs deceptive pollination (generalised food-deceptive orchid). The flower is nectarless, and the pseudopollinia (pollen mass) are not collected (or rather, is not food) by visiting pollinators. They merely look like co-blooming flowers that will reward the bee with pollen/nectar, thus tricking the bees into visiting the flower. Recent molecular reworking of Phalaenopsis have resulted in Doritis being considered as part of Phalaenopsis, thus the correct name for this orchid would be Phalaenopsis pulcherrima. However, the RHS Orchid Hybrid List still recognises Doritis as a genus for hybrid registration purposes, thus a hybrid between Doritis pulcherrima with a Phalaenopsis will still be considered as a bigeneric hybrid with the genus name of Doritaenopsis. Very pretty somehow remind me of living creatures near coral under the sea. And very easy to grow. Of course it looks better if grown in large clumps. They produce side shoots after a while.